Happy Memorial Day! While we all honored those who have dedicated their lives for fighting for our freedom we wanted to share with you the outdoor fire pit we recently created. This is a fairly inexpensive project and only takes about a half day to complete! Not only does it add a lot of characteristic to our backyard but it also will add a little more value to our home! Once again, we partnered with our friends over at Homes.com to create a video to share with the world on just how we created our Outdoor Fire Pit. 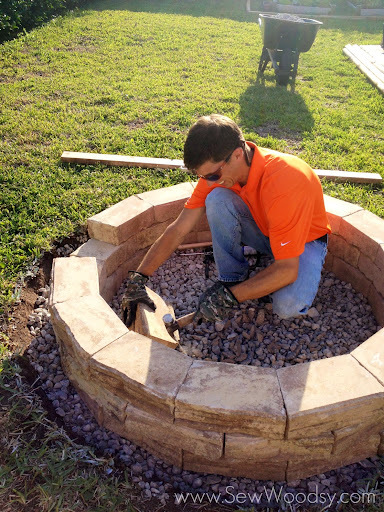 Watch our video to learn just how easy it is to build an outdoor fire pit. So, what do you think? Pretty darn cool, right? I’m so glad we tackled this project even though I will be the first to admit that I was against building a permanent fire pit in our backyard. 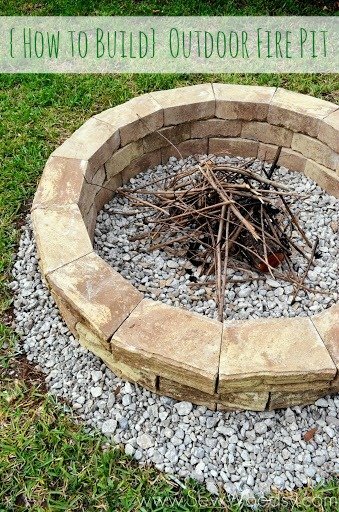 Here is the list of supplies in case you want to tackle this project and build a permanent outdoor fire pit in your backyard! Long story short. I bought Jon a metal fire pit years ago when we first moved in together. We had used it maybe two times during the two years we lived in our town-home. Fast forward to owning our home… I think we maybe used five times before it finally bit the dust. Last spring we used the metal fire pit once and then it never was moved back in to the garage. It sat all summer and fall outside; getting battered by the Florida afternoon rain-showers. We finally drained the water from the metal fire pit on new years eve. It was cold for a Florida night and we had our neighbors over to “toast” in the new year (ok, for drinks and an outdoor fire pit). Half way through our drinks, the fire fell from the metal pit and on to the grass. I may or may not have freaked out. Thankfully the fire did not spread and the next day we woke to a nice circular patch of grass missing thanks to the fire pit debacle of 2012/2013. Jon was sad to see his beloved metal fire pit go. He had talked about building an permanent stone fire pit for a while. So when we had the opportunity to build one for Homes.com we knew we were going to jump at the chance. Well, let me get this straight. He knew it and did a lot of convincing to get me on board. Once again… here I thought you just dig up the grass and pour the crushed concrete rock in the ground and put the flagstone blocks in a circle. Wrong! Jon is so dang meticulous. I have a love/hate relationship about this. I love it that he wants to do the best job ever, but I hate that it takes him forever! However, for this project I was shocked that it took us only a half day to complete! Our backyard has a slight slope, so this took a little longer for him to complete. By using an old 2 x 4 and a level he was able to make the fire pit level. And this is what it really looks like behind the scenes. Our hot tub was pulled apart since it sprung a leak while I was gone at SNAP! and all the water leaked out (but that is an entirely different post). All the dirt from the fire pit was put directly behind me. And here you go… she was done just like that in all her glory! I love the detail from the flagstone! That night, Jon, had to make a fire to try out his latest project! Lucky for him, it just so happened to be a cool Florida evening (I say cool I am talking high 60’s low 70’s). The fire pit worked like a gem! So did we inspire you? Who else will be making a fire pit, soon? Looks great! Doing this at the next house! Thanks Sarah! It’s really not that hard!!! This will be perfect at your next house! Yay! We have a firepit in our backyard (it came with the house) and thanks to Mark’s initiation, we use it quite a fair bit (in the non-summer months that is). I love the look of how yours turned out. John really did such a great job making it level, sturdy, and good-lookin’, too. Thanks Lauren! Some may find it odd to make a fire pit in Florida but it really does come in handy! This looks great Katie!! This is one of our summer plans – thanks so much for the tutorial! How long did it end up taking to build? Thanks Jenn! Once all the supplies are gathered it took us about a half day from start to finish! So maybe 4-ish hours? Let me know if you guys build one!! LOVE this! I’m wanting to do one in our courtyard and this is a great how to Katie! Great job:0) Bookmarking and pinning! Thanks Destiny! I’m glad we had the opportunity to create it! Thanks Andi! Seriously, it’s one of our best projects to date! I love how this came together. My husband and I have wanted to do this in our yard for quite some time. Thanks for sharing the details. Brandi! Thanks for stopping by. 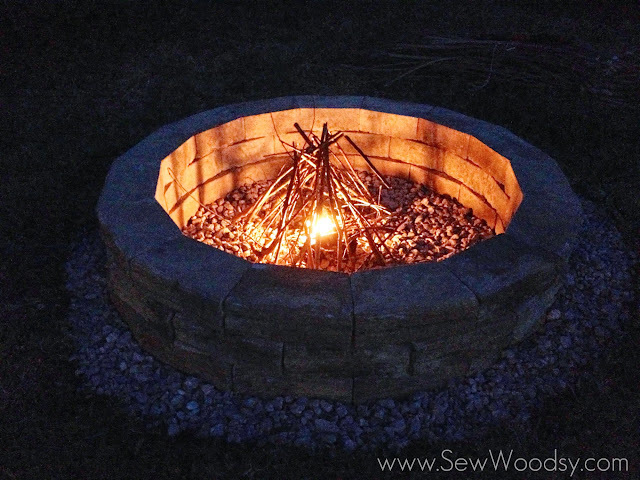 Please share your final project if you end up making a fire pit! Great summer project for my son and I to “bond” over! We use our fire pit all the time and it’s on its last legs. Can’t wait to get started! Thanks Tami! If you guys make one please feel free to send photos I would love to share it with our readers! Hi! Great project and accompanying video! 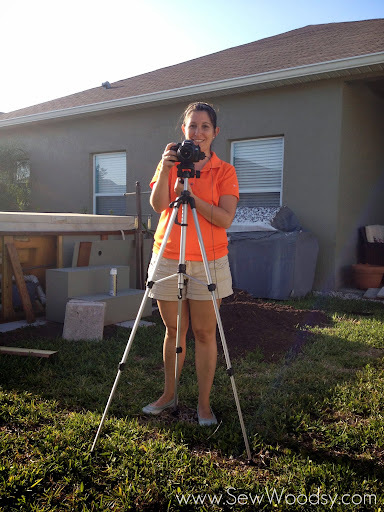 What is the diameter of your pit and how did you come up with the needing to dig down about 6 inches…questions from my husband as we plan this project for tomorrow! Hi Sarah, sorry I’m just seeing this now. The digging down is to allow water to drain. The inside diameter is 45″ and the outside diameter is 5′. Good luck building it if you have any more questions feel free to e-mails us for a quicker response. Just wondering about how many flagstones were used to create this fire pit? Hi Corey, We used 48 flagstones. I believe though we did pick up a few extra in case we had any issues with the brick and then once the project was done we took back what we didn’t use. Great project, looks tidy and simple to put together. I am wondering about the fire-resistance of these bricks though, as well as the caulking, I’m really not sure it’s made to withstand high temperatures. Wouldn’t it just melt? Shouldn’t we use refractory bricks & mortar instead? Hi Antoine, we’ve done a number of fire pit burns and have never had any issues. We also keep smaller fires and the fire never touches the bricks. You don’t have to do the caulking but it helps keep the place secure incase you have little ones near by that want to play by the fire pit (when no fire is present). You don’t have to worry about bricks following on them. We really like this guys and will feature it over at ours this week. Will drop you a line when its up. Please, consider us if you have anything else you’d like to share or feature. Hi Cheri–thank you for taking the time to leave a comment. We bought them at The Home Depot a few years ago. Maybe try Lowes or a brick paver place that would sell flagstone. Good luck! This is one of our summer plans – thanks so much for the tutorial! How long did it end up taking to build? Ohhh That’s a wonderful thing for my house in the future.